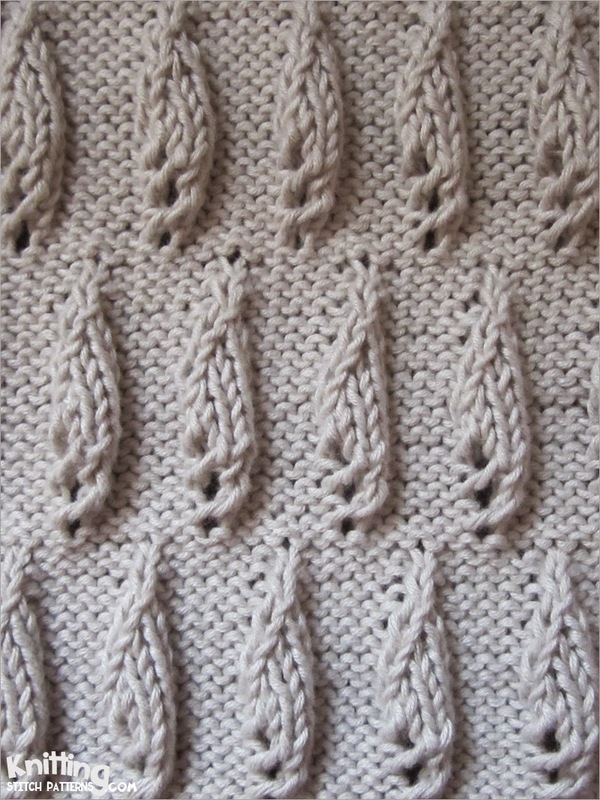 The Snowdrops stitch is a 32 eight row repeat and is knitted in a multiple of 6 stitches plus 3. Row 1 (right side): * P6, yo; repeat from * to last 3 sts, p3. Row 2: K3, * p1, k6; repeat from * to end. Row 3: * P6, k1, yo; repeat from * to last 3 sts, p3. Row 4: K3, * p2, k6; repeat from * to end. Row 5: * P6, k2, yo; repeat from * to last 3 sts, p3. Row 6: K3, * p3, k6; repeat from * to end. Row 7: * P6, k3, yo; repeat from * to last 3 sts, p3. Row 8: K3, * p4, k6; repeat from * to end. Row 9: * P6, k2, k2tog; repeat from * to last 3 sts, p3. Row 10: K3, * p3, k6; repeat from * to end. Row 11: * P6, k1, k2tog; repeat from * to last 3 sts, p3. Row 12: K3, * p2, k6; repeat from * to end. Row 13: * P6, k2tog; repeat from * to last 3 sts, p3. Row 14: K3, * p1, k6; repeat from * to end. Row 15: * P5, p2tog; repeat from * to last 3 sts, p3. Row 16: Knit all sts. Row 17: * P3, yo, p3; repeat from * to last 3 sts, p3. Row 18: K3, * k3, p1, k3; repeat from * to end. Row 19: * P3, k1, yo, p3; repeat from * to last 3 sts, p3. Row 20: K3, * k3, p2, k3; repeat from * to end. Row 21: * P3, k2, yo, p3; repeat from * to last 3 sts, p3. Row 22: K3, * k3, p3, k3; repeat from * to end. Row 23: * P3, k3, yo, p3; repeat from * to last 3 sts, p3. Row 24: K3, * k3, p4, k3; repeat from * to end. Row 25: * P3, k2, k2tog, p3; repeat from * to last 3 sts, p3. Row 26: K3, * k3, p3, k3; repeat from * to end. Row 27: * P3, k1, k2tog, p3; repeat from * to last 3 sts, p3. Row 28: K3, * k3, p2, k3; repeat from * to end. Row 30: K3, * k3, p1, k3; repeat from * to end. Row 31: * P2, p2tog, p3; repeat from * to last 3 sts, p3. Row 32: Knit all sts. Knit: K | Purl: P | Yarn over: Yo | Knit 2 sts together: K2tog.